Leg Compression machines or Intermittent Pneumatic Compression (IPC) devices are used for the prevention of clotting of blood in the lower extremities of the body like the calves and thighs. You have come to the right place if you want to know all about these devices. We will discuss the right risk populations that may need to use these compression devices, the benefits associated with their use, how you know if you need them, where to buy one, any side effects of their use. We will also recommend our best pick for Leg Compression Machines that are used in hospitals. How do compression devices in hospitals help? Do you need to use them? Rapid Reboot are world class professional compression boots. They are used at all levels including in the Olympics, by professional players, and for medical purposes. 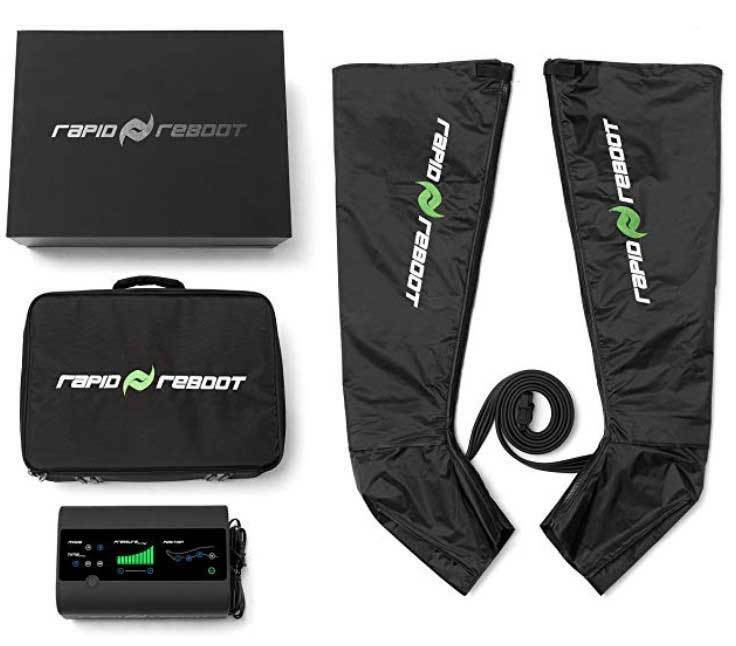 The Rapid Reboot Recovery System works with specialized dynamic technology that compresses your legs to improve circulation. It increases the reach of metabolites to the muscles that need them most and this makes it very efficient. They work to remove toxins, reduce inflammation, and promote healing. They are even used for treating lymphedema, poor circulation, tension, cramps, sciatic nerve pain and many other circulatory disorders. They offer a customizable interface so that you can use them according to your needs at different pressures. It even has an easy to use timer setting, at the end of which, it automatically turns itself off. It also has a position indicator that allows you to customize your position to reach target areas or to keep away from tender areas. Rapid Reboot Recovery System uses a lightweight material that makes them very comfortable to wear. They are also very heavy duty so you won't have to worry about them falling apart after a few uses. It has a padded interior that further adds to the comfort of the compression boots. A DVT (deep vein thrombosis) is a very dangerous medical condition. It basically means that a blood clot has formed in the deep veins of your legs or thighs. They are usually found in the lower extremities (legs and thighs). Their formation is closely associated with physical inactivity and long periods of immobilization. Prolonged immobilization leads to pooling of the blood in the veins of your legs and this further leads to the formation of clots. This clot is then called a DV. It can then break off from its original site and travel through the blood vessels and can block any of the smaller vessels in the body. This can lead to death if not treated promptly. There are a number of factors that can increase your chances of getting a DVT or clot. The most important of these is immobilization. Immobilization may be due to a recent surgery or an injury. Research proves that rapid mobility improves the success rates of surgeries because it reduces the chances of clot formation and encourages healing. Mobility may be limited due to a number of reasons, these may be due to prolonged traveling, or medical conditions like strokes or inflammatory conditions of the body. People with inherited disorders that have over-active clot formation may also be at risk along with pregnant ladies. Others at risk include obese people, smokers, and older individuals. Cancer treatment may also increase the risk of the patients forming clot where they are not needed, leading to DVT. IPCs are used mainly in hospitals and if they are recommended for home use, the patients are instructed in detail about their usage. There are many ways to use them and people may use them differently based on their own requirements. The compression devices work to ensure that a justifiable pressure is maintained within the vessels of the leg and calf. This means that it discourages pooling of the blood in your legs. It thus improves blood circulation and allows your body to regulate its resources more efficiently. The constant pressure encourages a static time in the vessels of the thighs and helps the blood to return back to the general circulation. They enclose whatever part of the body you tie them on, and they should feel snug, not too loose and not too tight. Dont get confuse with foot circulation machines or foot massager, this is totally different tools. Why is this recommended? It is recommended by health professionals for a variety of reasons including the fact that they encourage fluid and blood movement. They are also very easy to use, this makes them very convenient. You just need a medical health professional to teach you how to use them once and then you can easily use them at home. These have been clinically proven to be life-saving. They have minimal side effects and it allows for eligibility of medical reimbursement. What makes it so great is that it is absolutely non-invasive so it doesn't typically freak the patient out immediately. Whether you need to use them or not depends on you entirely. It is best to consult with your physician before you actually start to use them. You should consult a doctor because they are most aware of the medical conditions that you are suffering from and if using these devices will help in any way. Chances are that if you are or will have to remain immobilized for a long period of time, your doctor will receive their use themselves, or if you have ulcers that are seen in venous stasis. If they don't, you can always ask them to make sure. A lot of people use them for non-medical purposes as well, especially athletes. But if you plan on using them for medical reasons, like swelling or lymphedema, consult with a doctor before use. Like any other procedure in the world, this too carries risks. It may cause I tense discomfort stimulated by sweating under it. It may also cause the skin to dry out or break down especially if it remains in close contact with the skin for long periods of time. Other more serious side effects of this procedure include nerve damage and pressure damage, though equally rare, are possibilities. These complications can be easily avoided if care is taken when applying the cuffs. You can easily look for pressure injuries because they usually begin with swelling or discontinuation of the skin underlying the cuff itself. Leg Compression device in hospitals has been proved to have remarkable and lifesaving effects in people's lives. They tend to work so that they provide the user with great comfort and encourage healing and reduce swelling. Their use is best when recommended by the doctor. We would personally like to recommend the Rapid Reboot Recovery System Compression Boots because of the wide variety of settings they offer and how easy they are to use.